When you think of Italian food, I bet that the first three words that pop into your mind are pizza, pasta and gelato. Without a doubt, they are all fabulous and I can happily live weeks on end on a diet of their endless variations. Still, when you are in Italy, either visiting or living here for an extended period of time, it would be such a shame not to explore the many delights Italian cuisine has to offer. 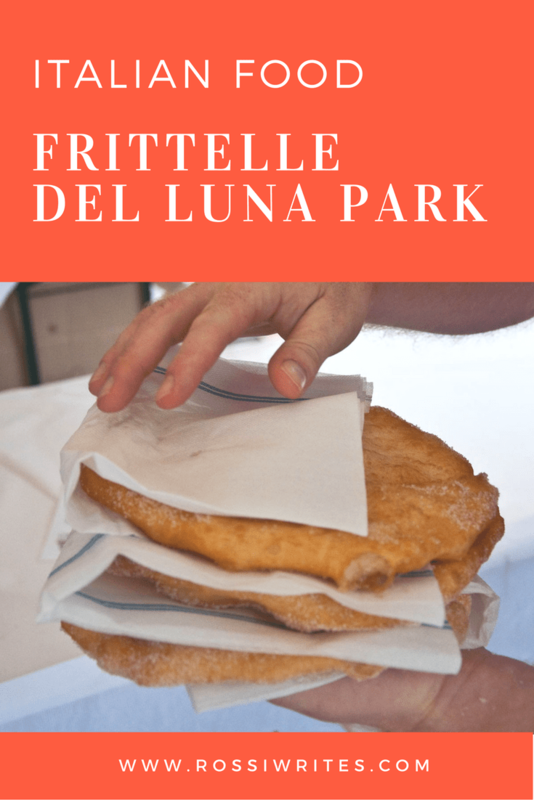 So today I want to introduce you to one such thing – a deep fried generously sprinkled with sugar Italian delight, called Frittelle del Luna Park. True, it sounds like a calorie-laden cholesterol-ruining food bomb, but, believe me, at the right moment and in the right quantity it tastes simply divine. 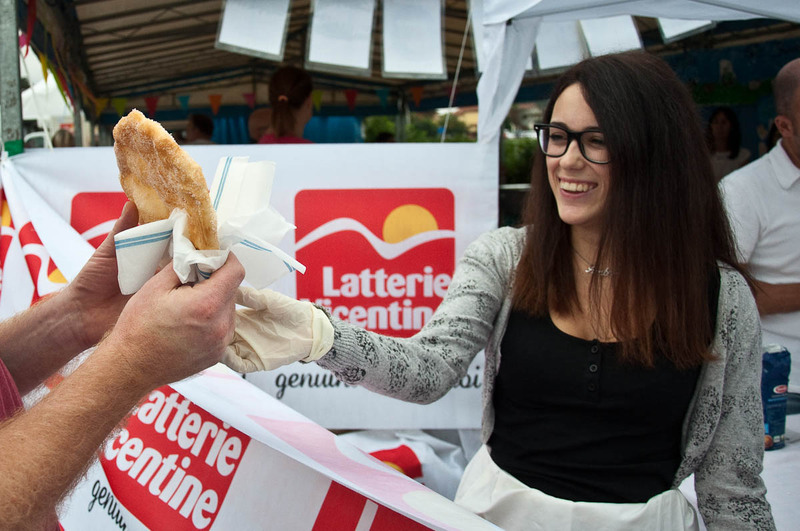 You will find frittelle del luna park at foodcentric events all over Italy like markets, festivals and those dedicated to a famous local foodstuff feasts called sagre. In other words, one of those places you go to with the idea to treat yourself to some gorgeous food and aren’t averse to loosen your belt a notch or two. After walking around from stall to stall or eating a lovely locally sourced meal, there is nothing better than to round it all up with a tasty crispy frittella. The frittella (pl. fritelle) del luna park starts as a small ball of dough made of flour, water, salt, yeast, milk and cream or butter. The dough is then hand-stretched to a large flat disk. The disk is dipped in a vat with hot boiling oil and once it turns golden in colour is plucked out and sunk into a large container overflowing with sugar, so that the crystals can stick to the still hot crust. Then, you just need to tuck in, either by taking large greedy bites straight off the disk in your hand or by tearing smaller portions off it which you then are welcome to stuff in your mouth. 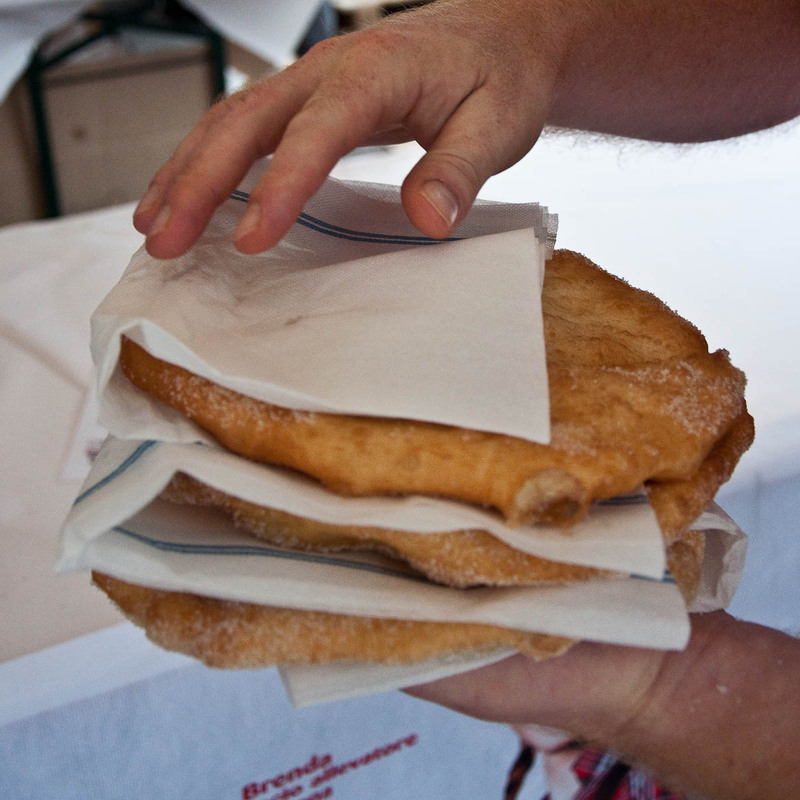 The fried dough is crispy, yet chewy and at the same time it melts on your tongue. The sugar crystals scatter down all over your clothes and your fingers get greasy with the oil, so that then you need a serviette or even better a wet wipe to clean it all off. That’s it, unless you do the right thing and simply lick them off. It is one of life’s simple delights and depending on your appetite you can either share a frittelle del luna park with your significant other or keep it entirely to yourself. This is exactly what I did the last time that we had a chance to sample the round fried disks. 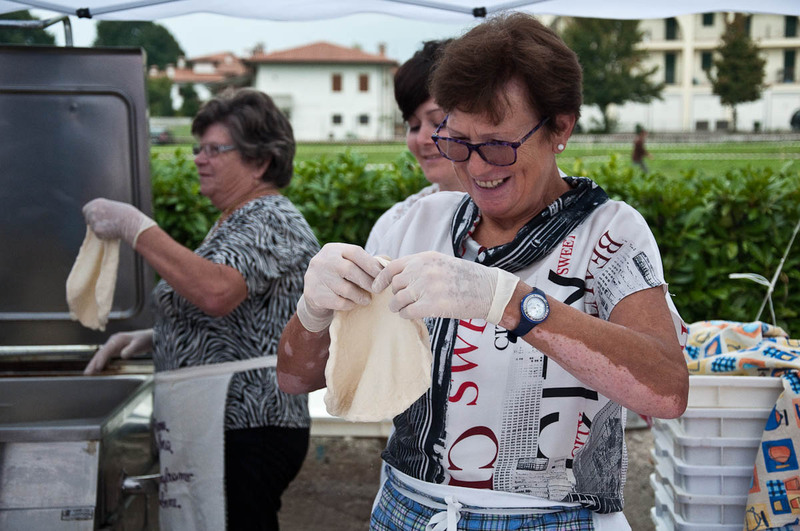 A couple of weekends ago we spent a lovely Sunday afternoon at a dairy festival in the small town of Bressanvido which is less than 30 mins away from our current base of Vicenza. 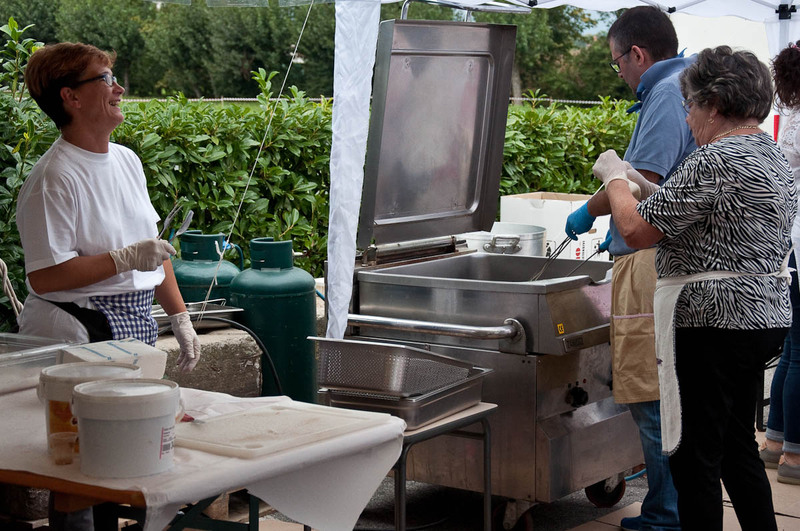 Bressanvido is where a large company – Latterie Vicentine – has a cheesemaking plant and once a year a fab festival is held to celebrate the local dairy tradition. Many stalls had been set up, visits to the cheesemaking plant were taking place every half an hour and you could even squeeze in a visit to a dairy farm where you could pet the cows. The PA system was pumping out unforgettable hits from the golden era of the 80’s and people were out and about in their Sunday best enjoying the relaxed festival atmosphere. We had a great time and one of the highlights of the afternoon was the frittelle del luna park stall. It had been set up by a parents’ committee in order to raise funds for a nearby school and it was doing a brisk business. We also joined the queue and after admiring the skillful process of stretching the balls of dough into large disks and then dipping them into the hot oil, we were handed our three still piping hot frittelle. To round it all up, let me just tell you that in fact there are many different types of frittelle in Italy. 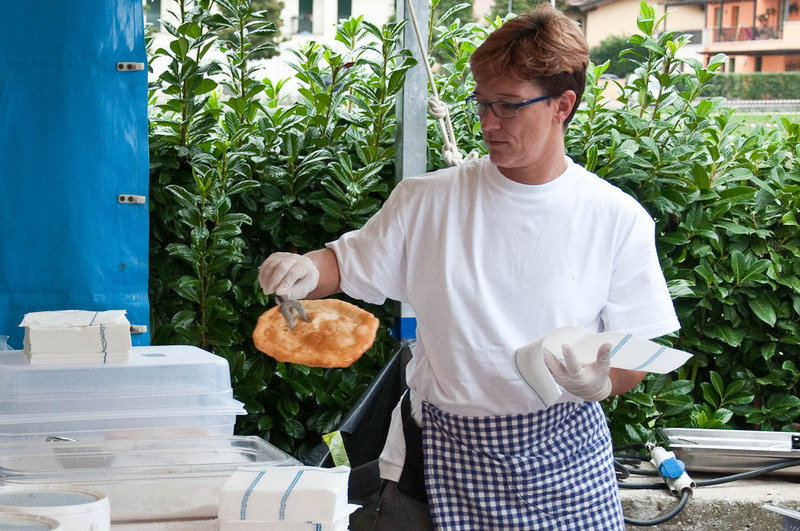 The most famous of them, I think, are the frittelle which are eaten during the two-week long Carnival season and which are little balls of dough deep fried and either studded with raisins or filled up with chocolate, zabaione or custard. I told you about them in this blog post, just scroll down to number two in the list to see pictures. Hence, to differentiate them, the large flat disks of frittelle are called frittelle del luna park. A luna park being an amusement park or fairground in this context, as this is where (along with markets, festivals and sagre) you will most likely and most often find this particular type of frittelle. Have you tried fritelle del luna park yourself? Or any other type of Italian frittelle? What is your favourite Italian food. Share with me your thoughts in the ‘Comments’ section below. I would love to read them and engage with you.